Great news, ladies. The end of the all-male board is here. Sort of. There is now at least one woman on the board of every single one of the top 100 companies in the U.K. It's the first time in history that this has happened, and the Brits are pretty happy about it. 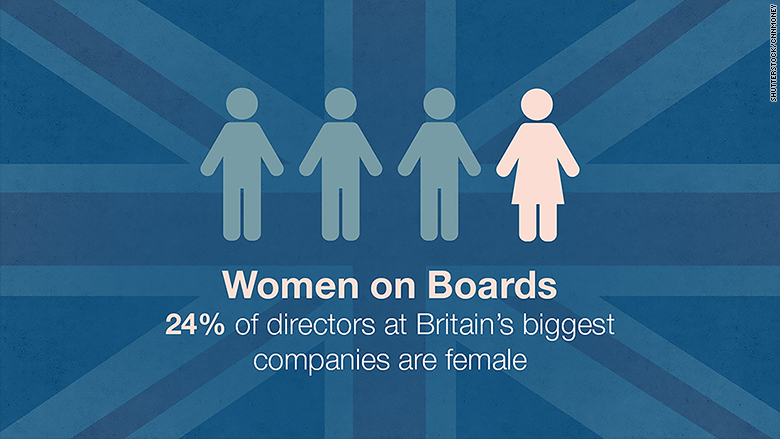 A government-backed report found that a quarter of board members in British blue chip companies are now female. That's double the 12.5% of board seats women held in 2011. "What we have in fact seen taking place, is little short of a revolution in boardrooms of FTSE companies," Lord Davies, the author of the report, said. In comparison, S&P 500 companies have 19.2% female board members, according to data from Catalyst, a group that lobbies for women in business. According to the Davies report, women now hold more than a quarter of seats on boards of 41 of the FTSE100 companies. The alcohol maker Diageo (DEO), Intercontinental Hotels Group (IHG), and the insurance company Admiral Group (AMIGF) are leading the pack, with over 40% board seats held by women. But the report said British companies should go further. The government set a new target: It wants a third of all seats on boards of Britain's biggest companies to be held by women by 2020. Unlike other countries, like Germany, France, and Norway, the U.K. does not enforce formal quotas on the number of women in leading positions. The government's targets are just recommendations. "The UK's voluntary approach is working, so it's right that this report sets business a stretching new voluntary target," said Matthew Fell, policy director at Confederation of British Industry. There are business reasons for companies to get more women on board. A research by the accounting firm Grant Thornton found that companies with women executives do better that their all-male board competitors. Grant Thornton looked at publicly listed companies in the U.K. and the U.S., and estimated that businesses with only male executives missed out on $641 billion in investment returns in 2014. Separate research by Catalyst said companies with more diverse boards tend to attract more talented employees, are more innovative, and have greater financial success than companies where men dominate.